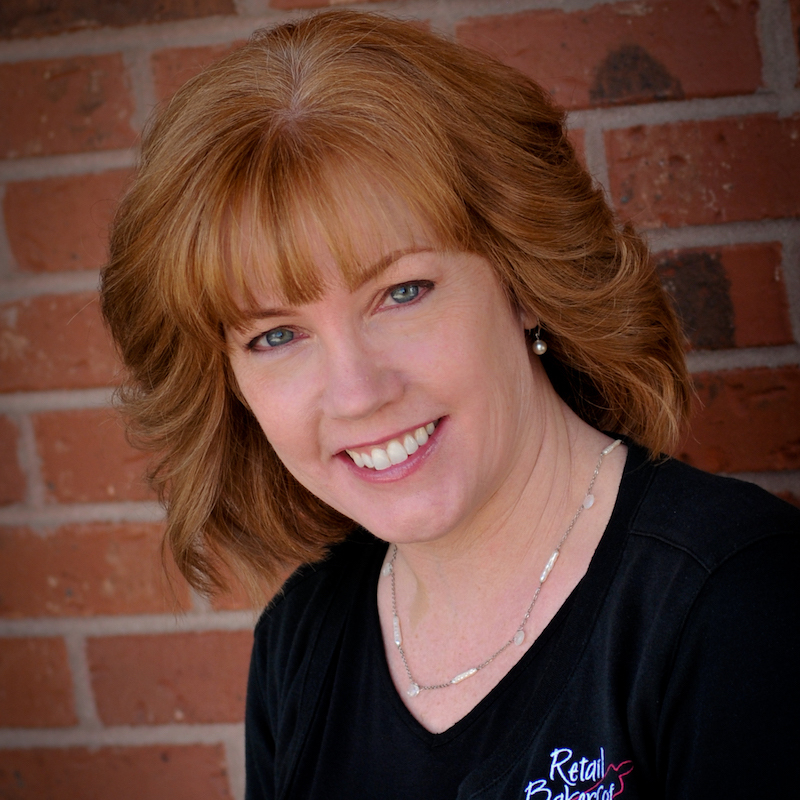 Beth Fahey is the current president of the Retail Bakers of America, the national trade association for retail bakers. She is a passionate advocate for education in the baking industry and is a sought-after speaker for domestic and international baking industry events. Her speaking topics include Pinterest and Profitability, Training Employees with Video Content, and Bakery Trends in America. Beth co-owns Creative Cakes Bakery & Cafe, located in Tinley Park, IL, with her sister Becky. Their bakery has been featured on several television shows and Creative Cakes is ranked as one of the top-rated wedding cake bakeries in America. Beth is a long-time member of the peer advisory group Vistage, and volunteers as the chair of the Main Street Commission for the Village of Tinley Park. Prior to owning her bakery, Beth worked as a camera assistant on television and movies. She resides in New Lenox, IL with her three children, husband Mike, and two dogs. I had always been interested in food since I was a young girl. Julia Child was on public television during the day, so I would skip school sometimes to watch. Becoming the owner of a bakery came out of left field. I had been a camera assistant on movies and television and was living in L.A. when my sister called and asked if I wanted to buy a bakery with her. We had three young children and thought that a change in career from the film business, to something more “normal” would be better for all of us. We moved back to Chicago in the late summer of 2002, and in December, my sister and I became the owners of Creative Cakes, the company she had worked for for ten years. Well, I had never owned a business before. Starting my career as an owner meant that I had to learn extremely fast about production, while simultaneously doing all of the accounting and marketing. We were the only two employees. We did everything from taking the order, to baking the cake, to delivering the final product. Oh, and we did all the dishes and mopped the floors, too. Our pre-schoolers spent afternoons watching Barney in a spare bathroom while we worked. Then we picked up our older kids at after-school day care on the way home. It was a crazy amount of work and stress. I honestly don’t know how we did it. Chauvinism hasn’t gone away. We did, and still do, run into salesmen that try to jack up the prices on things because they feel we aren’t either smart enough to notice, or strong enough to fight them. Being a part of a buying group – strength in numbers – has alleviated some of that. Dealing with equipment manufacturers and technicians has also proven to be a challenge. A technician once asked me if he could “speak to the maintenance guy”. I told him he was. We have owned the bakery since 2002, so coming up on fifteen years. Becoming the president of the Retail Bakers of America and then shortly thereafter being asked to speak on bakery trends in America at the Craft Bakers Conference in the U.K. The talk was well received and an article about the trip was covered in Bake magazine. To educate bakery owners on how to stay profitable, despite customer demands for lower prices. So many bakeries go out of business because the owners are artisans, not business people. They devalue their contribution and do not charge enough to stay in business. Every time we lose a local bakery, we lose another little piece of the craft. I really have two jobs. One is owning a bakery, Creative Cakes; the other is being the president of the RBA. As a bakery owner, we follow the EOS model (based on the business book “Traction”). My internal title is Integrator. This means I oversee all departments, including Sales & Marketing, Production, and Finance. We have managers in Production and Finance, but because we are a relatively small company (under $2M per year), I also the head of our Sales & Marketing department. For RBA, I am mainly responsible for big ideas, strategic planning, and special projects, like launching National Bakery Day. Find out who you are before you commit to any particular position in a bakery. Personality tests are extremely valuable to this end. DISC profiles, Meyers-Briggs, and Predictive Index are some examples of well-respected personality tests. The reason I say this, is because as a bakery owner, I have made more than my share of hiring mistakes. Often, it’s not that the person is unskilled, or unintelligent, It’s because they are sitting in the wrong seat on the bus. They’ve chosen the wrong path that runs in conflict of who they are as a person. For example, over many years of hiring and firing, I feel pretty comfortable making these generalizations: Bakers tend to like routine and no surprises. Cake decorators are social and need constant feedback from peers and management. Pastry chefs need to have a high attention to detail and the ability to be autonomous. Salespeople need to have a great deal of patience and the ability to listen and really hear what the customer wants. Knowing who you are and what you like to do, and don’t like to do, will increase your chance of success, whether in the bakery, or any other industry. I love to travel and to be outside. Hiking has always been a passion – and I have a new goal of hitting all of the National Parks before I make my exit. Cycling is also something I love to do. I generally ride around fifty miles per week in the summer. Cooking is still a passion. Despite owning a bakery, I really love the savoury side. My family eats really, really well. Julia Child. Her career as a cook came later in life. She learned all that she could and made herself an expert in a field dominated by men. Not to be outdone, she and her cowriters spent years on writing the definitive cookbook of the mid 20th Following that, she became a passionate educator and accidental celebrity. All this, while honing an amazing sense of humor and love of life and art. Well, Julia Child, of course. Doesn’t everyone want to be Richard Branson? Vision, creativity, and fun – plus the financial wherewithal to back it up! I love our RBA Roadshows. It’s a one-day event where bakers and vendors get together in a different location once a quarter. (Seattle, Chicago, Cincinnati, Minneapolis, etc.) We have a small tabletop trade show with vendors, bakery tours, and education. The conversations are more intimate and the quality of the educational seminars is the same as at IBIE. Sourdough bread, with a crispy crust and a schmear of butter. Don’t be afraid to have fierce conversations. Most of the problems I have had in my life, either personally or professionally, had to do with the fact that I chose to remain silent when a conversation was needed. Getting over that and learning how to have a fierce conversation was something I learned much too late in life. To me, true success is becoming self-actualized. This means living your life to it’s full potential, doing the best you are capable of doing. Success is not defined by status, material wealth, or what schools your kids got into. It’s all about how comfortable you are in your own skin – and the desire to always become a better you. The proudest moment in my career was a completely spontaneous moment last year, when our decorating team was cleaning out their stations. They discovered some writing they had done and had stored in drawers at their tables. Several years ago we did a visioning workshop with our staff. They wrote down their visions of what their lives would be like in five years. Many of them found their visioning books and one-by-one read aloud goals like, “compete in a national cake decorating competition”, “get married”, “have a baby”, “teach decorating classes”, and so on. Most of them had hit their goals – and were surprised that they had written it down and actually accomplished what they had set out to do. Seeing them reflect back on their writing with a big smile was really something to see. Since I essentially bought my own job, I guess it was having the ability to recognize an opportunity when it presented itself. Just like you have an inner voice that warns you when you are about to make a bad decision, there’s also one that speaks to you when an opportunity presents itself. My big break was a result of me seizing on a positive vibration and having the confidence to execute the plan.